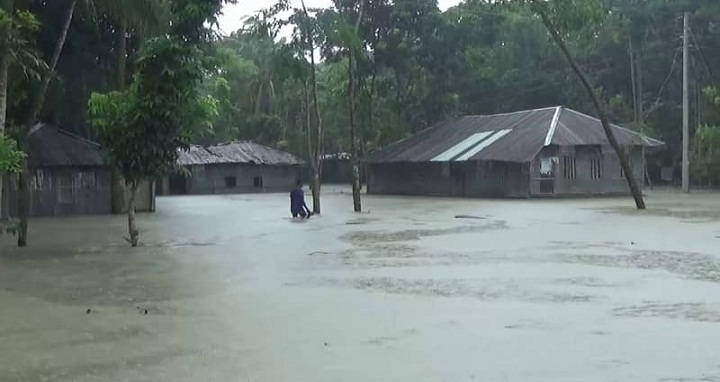 Dhaka, 17 July, Abnews: At least seven hundred families of five villages in Tazumuddin and Char Fasson upazilas in the district have been flooded following tidal water and heavy rainfall for last two days. The ring embankment near the earthen dam of Dalalkandi area of Chandpur union in Tazumuddin upazila was broke down on Saturday noon following the rush of tidal water. Water has been rushing in through the damaged dam, flooding the low lying areas, said Executive Engineer Kaiser Ahmed of Bhola Water Development Board (WBD). Dalalkandi, Chowkidarkandi and Mawlanakandi villages of the upazila have been flooded due to huge tidal water, creating suffering to around four hundred families. Besides, around three hundred families in Mujibnagar union of Char Fasson upazila have been marooned following the rush of tidal water through one-km damage embankment in Char Motahar point of the union. However, while asked, the WDB official said the embankment could not be repaired for lack of allotment.